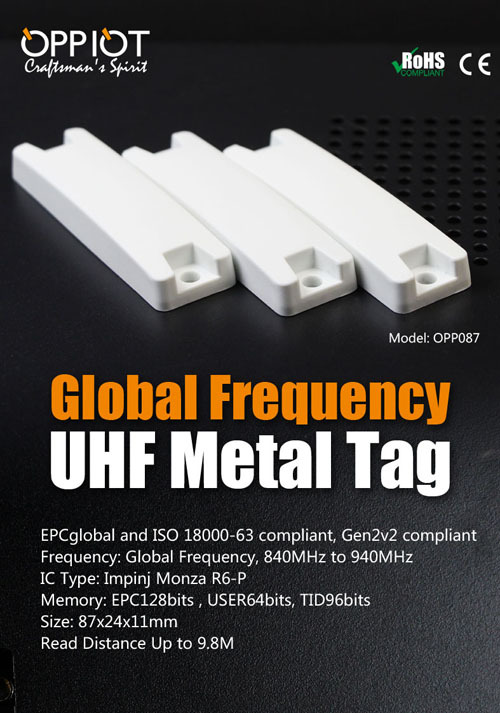 "OPP087, a versatile UHF on metal tag with adorable cost has been designed for global frequency (840MHz to 940MHz). With the PC shell, it can withstand temperature from -30℃ to +70℃, thus it can be used for both indoor and outdoor application. What’s worth mentioning, the read range can reach up to 9.8m on metal. Our core competence is the personalization of the products as well as creating customized designs. Product fields covering Industrial Tag, Specific UHF tag, PCB UHF on-metal tag, High temperature on-metal tag, High temperature FPC UHF Inlay, Long distance UHF on-metal tag etc. Our products are used in different application areas such as Asset Tracking, Inventory control, Automated vehicle identification, Attendance Taking, Environment monitoring, Access control and Warehouse management, and more.